Home » What Benefits are there in Choosing a Single storey home in Perth? Despite the current trend of upsizing to double storey homes, single storey homes still remain the traditional style of home in Perth and there are several reasons why building a single storey designcan be more practical than building upwards. The most obvious reason to stick with a single storey home design comes down to cost. As you would expect, a multi-storey home costs more to build because there are more materials required, not to mention the extra equipment such as cranes and scaffolding required to complete the project. In saying that, even with single storey dwellings- the bigger the home, the higher the cost of building. 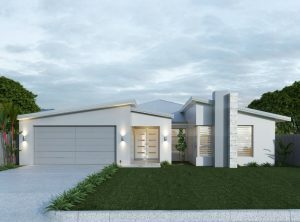 Another benefit of single storey homes in Perth particularly is the increased energy efficiency, meaning the home is easier to cool in summer and heat in winter compared to double storey homes which require more complex and costly HVAC (heating, ventilation and cooling) systems. It is also much easier to expand the living space in a single level home by building on extra rooms or extending the outdoor living areas (provided you have the room on your block to do so) and without the structural demands of an upper level you have a little more freedom to build higher ceilings and make use of skylights and windows to make the home feel bright and spacious. Perhaps the best reason to choose a single storey home over a two storey is in planning for old age or for families with young children as stairs can be dangerous and inconvenient for these two age categories. For the elderly or wheelchair bound residents, stairs are just not practical and the cost to include an elevator or chair lift into the home may be way out of the budget. Children on the other hand tend to be fascinated with stairs, so unless you can keep your young kids monitored 24/7 there is bound to be some falls and injuries! Our last argument for the single storey lifestyle is the fact that keeping the house clean is much easier when you don’t have to vacuum or mop staircases and drag cleaning equipment up and down between levels. This also applies to the exterior of the home, cleaning gutters and windows can be easily achieved with the use of a ladder in a single storey home whereas doing these tasks for the exterior of a multi-level home is not so simple.